Enough boring you here, on to the good stuff! Here is my card for Sunshine's Stamps this week. This little guy is Chirpy. I thought he'd be perfect for a get well card for my uncle who just had emergency bypass surgery last week. I made this into a shaped card for our Sunshine challenge over on SNR. It's fun, you should try it if you get a chance! It was pretty fun to try - I used a Nestabilities die to cut out the card. Supplies are image by Sunshine's Stamps colored in with Prismacolor pencils and softened with OMS (trying something new for me). 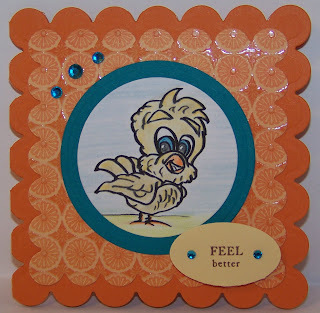 DP by DCWV, cardstock by SU in Pumpkin Pie, Tempting Turquoise and So Saffron. Sentiment PTI Mixed Messages. Rhinestones are Kaisercraft from Paper Jewels. Ooh, how adorable! This is such a cute bird image and I love the turquoise and the saffron! This is sooo adorable Colleen! I love the layers & colors you chose. Hugs! Neat shape!! I love the scallops :) Very cute card! Great job on the shape challenge! Love your card. Chirpy is cute! So cute - love the shaped card! OMG, what a perky little guy! Very cute!! I love the shape of the card, I'll have to try it! Great card..I love the shape!